Over the next 10 weeks we are going to be driving about 2,809 miles and through five countries in the Balkans. Although before we set out we faced our first challenge as a team, training. All great projects and teams need thorough training because as Benjamin Franklin said, “failing to prepare is preparing to fail”. There is no doubt that comprehensive training week is one of the key elements that fosters success and as Volunteer Christina said, “makes WAP stand out as a serious organization”. We are a quite International group of people this year. We have got Mariah and Colm, our dear Canadians, Dan and Ayelen our Brits, Meg from Cymru (Wales), Felipe and Ricardo our ‘Latinos’ respectively from Chile and Colombia, as well we have Christina our Norwegian fairy. Although, we only met 7 days ago the team has become fast friends and it feels as though we have known each other for years. We bonded as a team and our individual confidence levels grew as we prepared for the potential challenges ahead. Throughout training week, we shared stories of leadership, coaching, and personal experiences. This led to open and honest discussion with one another allowing us to develop towards a common goal. WAP 2017 Volunteer Felipe said, “The training was really useful, I feel more prepared”. Arriving at Atlantic College was a mesmerizing experience. Being greeted by St. Donat’s Castle was a great inspiration and introduction to the week we ahead. A massive thank you to our amazing hosts Atlantic College of the United World Colleges for welcoming us into your home. World at Play is an organization with extremely supportive Alumni who came to educate us on various sport and play related topics and develop new skills. For example, Pavlov made the trip up from London to share his knowledge on Eastern European culture and history. As well, he corrected our Serbian pronunciations and challenged us to lead games without the use of language. Thus, simulating the language barrier we would eventually face in Eastern Europe. However, we were able to use our native tongues or “gibberish”. A common theme arose of needing to exaggerate our expressions and demonstrations. This emphasized how important it is to use body language when teaching sport and play style games. Skill develop continued with the help of alumni Luke who taught us the value of using imagination to transform spaces. Specifically, small spaces, as demonstrated by the T-Rex Game which never failed to make us laugh! As well, he cheered us on at our first practical session at Bonfaen Primary School and led a game showing us first hand how to turn a football field into a Pirate Ship and himself into a pirate. Alumni and guest professionals helped to simulate sessions where children with disruptive behaviour, learning disabilities and physical disabilities might be present. Alumni Binti’s session, prepared us to cooperate as a team and be sensitive when individuals may require more attention. 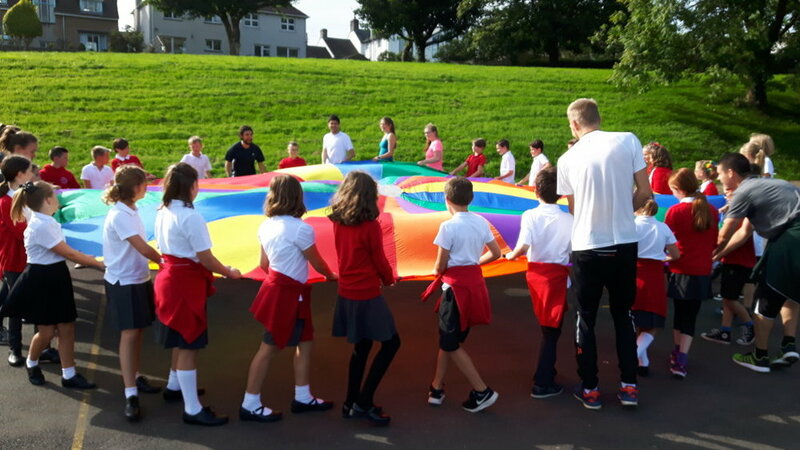 Simon, a guest professional from Disability Sports Wales, introduced us to inclusive language and adaptations within games around mental and physical disabilities. It was eye opening to experience things from the perspective of an individual in a wheel chair while playing a game. This granted us the tools to create and run a successful session at Cathays Inclusive Youth Project. WAP Founder Mike shared his passion for WAP as he told us how the International Project originated. Specifically, how this experience impacted them and the people they visited in the initial expedition. Later in the week Alumni Harry and Andy taught us the necessity of creating fun, competitive, and engaging games by keeping them simple with small progressions. As well, they showed us the importance of recognizing one another’s coaching styles as they ran a session with us and depicted their different coaching styles. On our last night, the team had dinner with the whole World at Play Family which both inspired and instilled a sense of belonging to something bigger than just us eight. Finally, we the WAP 2017 Team would like to extend a thank you to all of the World at Play Alumni and Professional Trainers that came throughout the week for providing us with confidence and new skills. All of which left us “buzzing for the adventure ahead” as said by WAP Volunteer Dan.